The latest press releases for NetVizor. "Employees Taken By Surprise by New Network Monitoring Technology"
NetVizor is the latest in award-winning network monitoring software. NetVizor allows a business to monitor their entire network from one centralized location! Now a business has the power to track workstations and individual users who use multiple PC's on a network. Quickly and easily perform employee monitoring, content filtering, remote administration, and more. Cedar City, UT (PRWEB) October 14, 2016 -- The latest release of NetVizor, version 8.15, now allows businesses to monitor any employee on their network, even when using the latest release of AOL Instant Messenger. 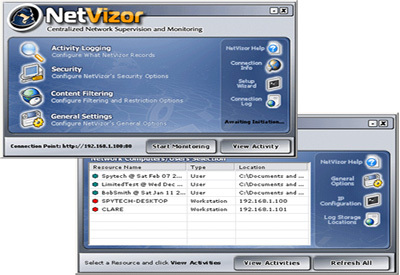 With NetVizor, the corporation has the power to log all keystrokes, see all websites visited, emails sent/received, windows viewed, applications ran, Internet connections made, passwords entered, chat conversations that were made, and even capture screenshots of the user’s activities. They could monitor their entire network of computers all from one centralized location. With these features, any business can quickly and easily track down employees who are slacking off on the job. Now they can find employees playing games, browsing the Internet, downloading illegal music, sending non-work-related email, etc, from a hidden centralized location without them ever knowing. NetVizor provides all necessary information an employer will need to quickly take corrective action against employees not working to their full potential. With usage logs, screenshots, and other statistics, the employer has all the proof they will ever need to properly reprimand bad employees. Most businesses don’t view their employees as a potential threat; however, Judith Collins, director of an identity theft program at Michigan State, randomly selected 1,037 cases from around the country, and then painstakingly traced each incident to its origins. In 50 percent of the cases, the victim's identity was originally pilfered by a company employee. In another 20 percent of cases, evidence strongly suggested dirty play by an insider. Now businesses can properly protect their intellectual property by quietly monitoring their network for suspicious activity using NetVizor’s network monitoring capabilities. Remote real-time administration, monitoring, and tracking of users on a network has never been easier!